The major remodeling is almost finished on the main level of our Fixer Upper, and I am getting really excited to begin designing and decorating inside. I’ve found myself reaching for my favorite interior design books for inspiration these last few days, and I wanted to share them with you! I’m going to start at the beginning of my collection, chronologically, and share a bit about each book, so you know if it’s one you’d like to put on your list. I began collecting interiors books a few years ago (2011!!) when Grace Bonney released Design*Sponge at Home. I had been a loyal follower of her blog, and loved how she shared real stories of real people. This book is is filled with still-relevant design inspiration, peeks of peoples lives and homes, and practical design advice. She even includes a budget-friendly DIY section, which really appealed to me in 2011 when we were just graduating from Law School and hadn’t had a design budget to speak of…well, ever. 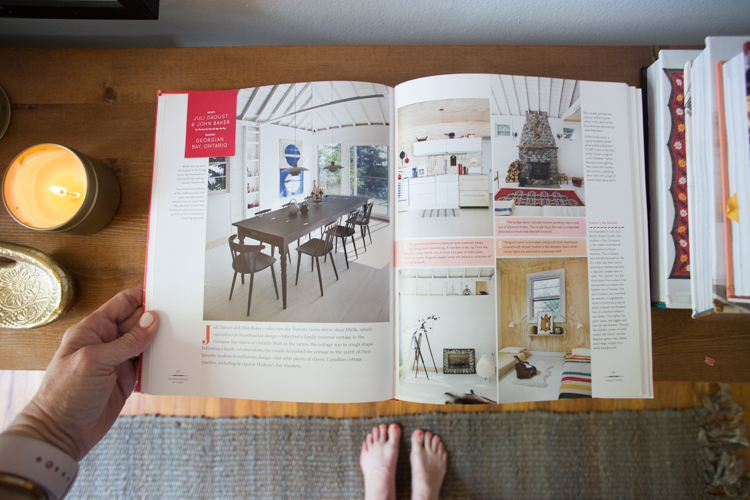 I still love flipping through these pages and seeing the different ways people make their homes their own. I love that most of the featured homes are small, some just dot-sized apartments. The design all feels real, accessible, and relatable. My cover is worn from years of use, and it remains a favorite. 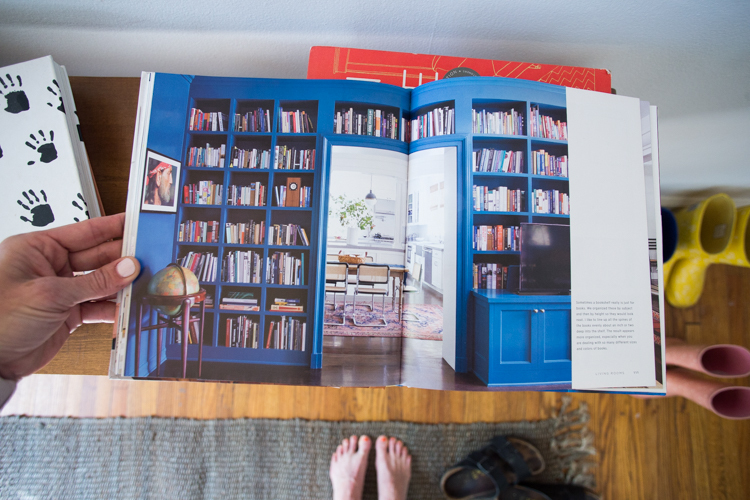 I loved Design*Sponge at Home so much, I decided interior books were worth the investment. Soon after, when I saw The Perfectly Imperfect Home: How to Decorate and Live Well by Deborah Needleman at Anthropolgie, I picked it up. This is a different type of design book, using illustrations rather than photographs to explain design rules, and how to break them well. 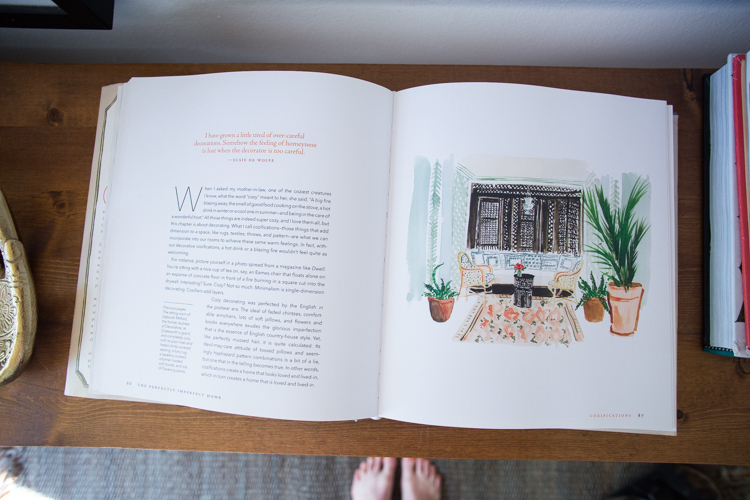 I love the beautiful watercolor illustrations, and also how Deborah talks about creating a home with a very down-to-earth perspective. As you can tell from the title, the aim here is an “imperfect home”, which is what most of us are used to living in. She takes the pressure off perfection and emphasizes using what you have well, creating useful spaces, and living content in your home. I love it. The next book I bought, Design Mom: How to Live with Kids: A Room-by-Room Guide by Gabrielle Blair is one of my top three favorites. I have read Gabby’s blog forever (well, since about 2009, which seems like forever) and worked with her on several different projects. I’ve even been a contributor to her blog, and shared our Texas home in one of her Living with Kids Features. Needless to say, I am a huge fan of her work, perspective, and practical design eye. This book offers so much practical information for designing a beautiful, family-friendly home, I think every household should have on. From solving problems like “Where do we put all the shoes?” to offering ideas for kids to feel involved in the decorating process, this book really taught me a lot about being thoughtful about all of the members of a household while designing the spaces. A house is so much more fun for everyone to live in when it is designed with everyone in mind. 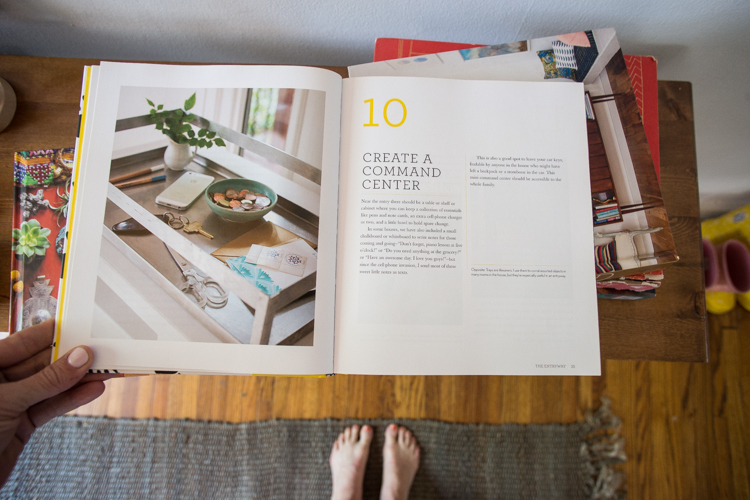 Styled: Secrets for Arranging Room, from Tabletops to Bookshelves by Emily Henderson was a landmark book in my design journey. I remember always scratching my head about how designers were able to take the same room as anyone else and elevate it with just a few simple changes. 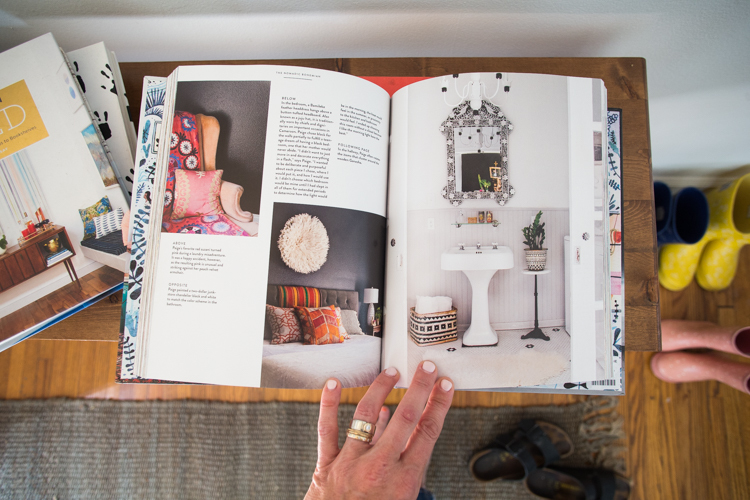 This book shares the concepts of “styling” versus designing or decorating. I love the huge, gorgeous inspiration images and the step-by-steps of arranging all different aspects of a home. Next, I anxiously awaited the release of The New Bohemians: Cool and Collected Homes by Justina Blakeney. Again, written by a superpower woman designer who I had followed, admired, and adored for years. I was super excited about The New Bohemians, because I relate to the idea of being somewhat “bohemian” in some aspects of my lifestyle. I love collected design, layers, traveling and including global pieces into my decor, and PLANTS! This book is so much eye candy for an untethered, casual, dreamer of a designer. Nothing about it is tucked in, puffed up, or too tidy. I love the colors, patterns, and inspiration from these real life homes. The book is broken down into sections, each a different type of bohemian. I identify most with the “Modern Bohemian” although the others (Earthy, Folksy, Nomadic,Romantic, and Maximal) all have pieces I relate to and gosh. The photos are gorgeous. 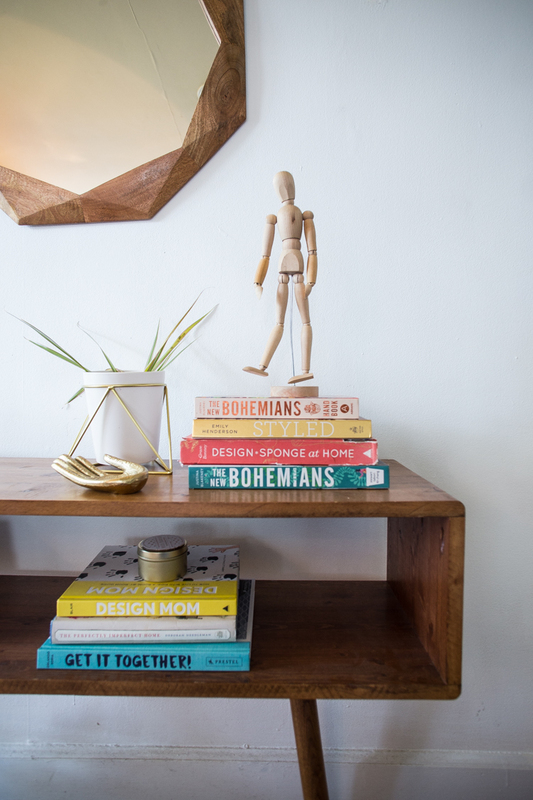 I loved it so much, in fact, that when Justina released a follow-up, The New Bohemians Handbook: Come Home to Good Vibes, I bought it immediately. 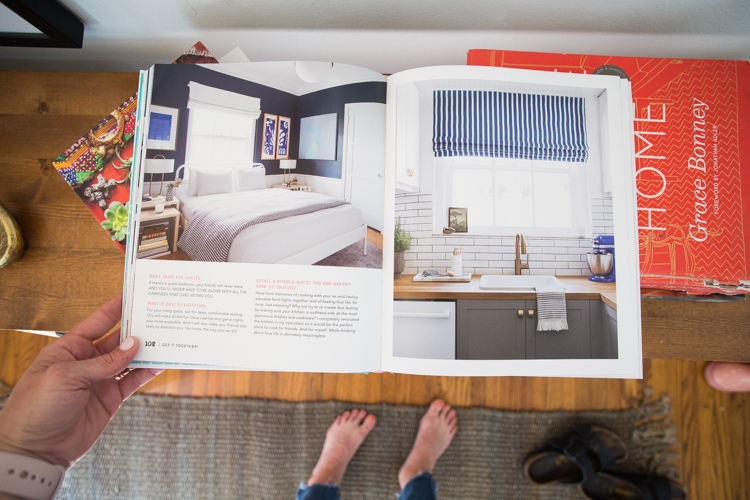 Rather than an introduction to the different styles and real-life homes, this book is more of a guide book to making decisions about your home. She walks you through creating a home with the vibes or energy you want to live with. The idea is a little woowoo, and still so important! I love this quote from the introduction, “The only design mistake you can really make is to life in a space that doesn’t reflect your personality, your desires, and your dreams– that is no way to live!” The book takes you on a personal journey through your own design priorities and how to achieve some of the important ends, like having a space that FEELS good, not just looks good. I just picked it up the beginning of this year (it was my Valentine’s Day book!) and I am really enjoying reading through it. Finally, my most recent design book purchase: Get It Together: An Interior Designer’s Guide to Creating Your Best Life, by the hilarious Orlando Soria. If you don’t follow Orlando on Instagram, start there. His stories are some of my very favorites. He’s been selling this book like a champ online–mentioning it in every way possible and hustling it so hard in the most fun and creative ways, I had to buy it. The copy of the book is entirely satirical, and laugh out loud funny. He is as sarcastic and dramatic in print as he is on his stories (and adds a few more colorful words than I expected.) Beyond the jokes, there are some really great, practical pieces of design advice through the book. And the photos are insanely pretty. Pulled together, styled, bright, beautiful and aspirational. It is a fun balance to the bohemian and family-friendly design books I already have, because it is neither and adds a great perspective. I’m a fan! 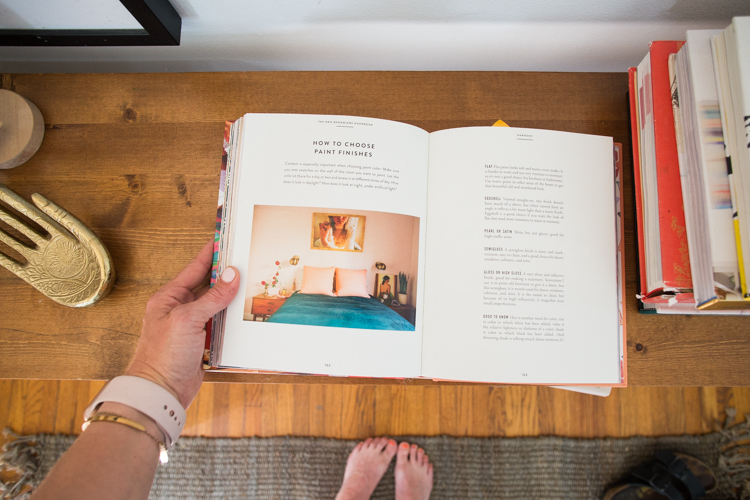 These tried and true favorite interior design books are giving me life and inspiration as I sort through ideas of how to create our new home. Looking at other people’s homes and reading their stories helps me remember how personal design can be, and how what works for me and my family is probably not exactly what will work for someone else. And that’s okay! It is also nice, with all of the millions of beautiful images online, to be able to hold some in my hands, take a closer look at the page, mark those that I want to return to, and have a way to gain inspiration away from my computer or phone screen. I have loved curling up on the couch at night, lighting a candle and playing some music, and chatting with Dave as I flip through these books, absorbing bits and pieces. I have also given some of these interior design books away as gifts, choosing the book that best matches the style of the recipient. It is a fun way to help share the interiors love with friends working on their own homes. What are your favorite interiors books? Leave them in the comments so I can make a wishlist and continue slowly building my collection of inspiration!